How long have you been a volunteer for Prevent Breast Cancer? I have been a volunteer for Prevent Breast Cancer for about 13 years. 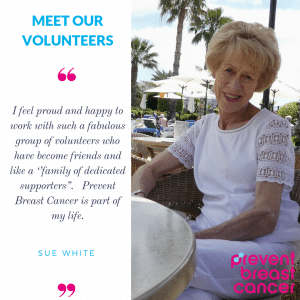 Tell us a bit about why you chose to volunteer for Prevent Breast Cancer. I volunteered for a brief time in the Chaplaincy and I think this led to my being approached to volunteer for what was then the Charity’s name of Genesis. In addition, my husband and my best friend had suffered from cancer. My husband had Hodgkin’s Disease 40 years ago and thanks to medical science and treatment at the Christie Hospital he is here today. Sadly my friend died of breast cancer 10 years ago. What makes you so passionate about the charity? Breast Cancer affects so many women and although great strides have been made in survival rates we still have a long way to go. I believe it will be possible in the future to prevent some cases. I support wholeheartedly the work that Prevent Breast Cancer is doing to achieve this aim. My favourite part of the role is the interaction with patients. In addition to this I enjoy the camaraderie amongst the staff and volunteers. What do you like to do when you aren’t volunteering for PBC? I enjoy looking after my grandchildren, working for other charitable organisations, playing tennis, going to the theatre and spending time with friends. Do you recall any memorable, funny or touching stories from your time as a volunteer here? It has been a pleasure to see the joy in patients when they receive “the all clear” of this disease. I have been astonished by the strength and courage shown by patients when they face the disease. What’s your favourite Coffee bar snack, sandwich or drink? Favourite coffee bar sandwich is coronation chicken on brown bread and the fabulous carrot cake that we have sometimes. It is a privilege to work amongst such dedicated, friendly staff for whom I have great respect. I feel proud and happy to work with such a fabulous group of volunteers who have become friends and like a ‘’family of dedicated supporters”. Prevent Breast Cancer is part of my life.